I was frustrated this week by Mayor John Tory’s pronouncement that he’s “not in favour of adding any more politicians here,” referring to the proposed new ward boundaries released last week that would increase the number of city councillors from 44 to 47. This is despite a rigorous and solid process, with plenty of public and stakeholder consultation sessions. But to Tory, “politician” is a dirty word. Never mind that the boundaries were created in 2000, from even older federal/provincial boundaries that based on the 1991 census, Tory doesn’t like the solution developed after three years of work. Instead, Mayor Tory wants staff to back to the drawing board and come up with a plan that he likes, following the fine tradition in municipal politics of ignoring the advice and hard work of staff and outside experts because you don’t like the answer they give. Tory’s hand-picked Executive Committee agreed with his motion to defer the debate until the fall. This is a problem. It’s necessary for aspiring candidates to be organizing right now if they want even a slight chance of knocking off an incumbent councillor. For that reason, the boundaries need to be decided as soon as possible. And adding three new councillors really shouldn’t be a big ask — it would cost $870,000 a year, including the costs of hiring additional assistants. One reason why Calgary’s Naheed Nenshi is a great mayor is because he trusts his staff and praises their hard work. I was at a lecture in which Mayor Nenshi took very little credit for that city’s response to the 2013 floods. Instead, he spoke about how he. along with senior city staff responded in a coordinated manner, involving all city employees and citizen volunteers in the effort to minimize the flood’s impact and clean up the damage. John Tory, on the other hand, shames city staff and local councillor Kristyn Wong-Tam in a crass stunt for Jack Lakey, author of “The Fixer” column in the Toronto Star. This reminds me very much of Rob Ford’s modus operandi. In the article, Mayor Tory is photographed cleaning up a planter on Alexander Street, as he explained that he was frustrated by the city bureaucracy who couldn’t get the planter repaired and looking good. Rob Ford was famous for this kind of stunt — filling in potholes, attending to residents’ complaints — often going over the head of councillors or city staffers. Urban forestry manager Dean Hart is named and shamed, but that department does not have responsibility for planters — that’s Transportation Services, which Lakey glosses over. To quote a friend: “so a city division which gets annual budget reductions declines to do work that’s out of scope, and in turn gets this response?” That’s not leadership. Leadership means addressing the real problems. Perhaps there is a problem with buck-passing. Maybe there’s a way to improve communications between city departments. A good leader involves the parties responsible and encourages them to find a solution, not publicly shame them. Maybe a leader doesn’t demand annual budget cuts in all areas (except, of course, the police), then blames staff when the effects of the budget cuts become visible. Meanwhile, Ward 27 is the most populated in the city, and Councillor Wong-Tam one of the hardest-working on council. Yet Tory doesn’t want to implement a sensible ward boundary plan. Running for election, John Tory liked using the word “bold” a lot, especially when he was touting his signature transit plan, SmartTrack. He promised leadership, but has instead dithered on or deep-sixed important initiatives, like a city-wide cycling network (He won’t back crucial sections of a new city-wide cycling network, saying only that he supports “sensible” bike lanes. On police reform, Tory dithered on eliminating the racist practice of carding until forced to take a position when a group of prominent citizens spoke out against it. As for social programs and revenue tools to fund essential city services and infrastructure, Tory would rather keep property taxes below inflation, despite the warnings of top bureaucrats. As Desmond Cole points out, Tory is pretty much carrying out Rob Ford’s agenda of low taxes, weak leadership on issues like police reform, and ignoring the plight of Toronto’s poor and lower-income residents. Car owners and homeowners (particularly the owners of single-family dwellings) rule in John Tory’s Toronto. Yet, we’ll keep up a needless section of elevated highway. But, at the same time, we can’t build a new streetcar line in the East Waterfront. As one person on Twitter pointed out, had we given central Toronto the representation it deserved, Council might have decided to go with the least-expensive Boulevard Option for the eastern section of the Gardiner Expressway. And committees like Public Works and Infrastructure, which has control over items such as cycling infrastructure, are dominated by suburban councillors. 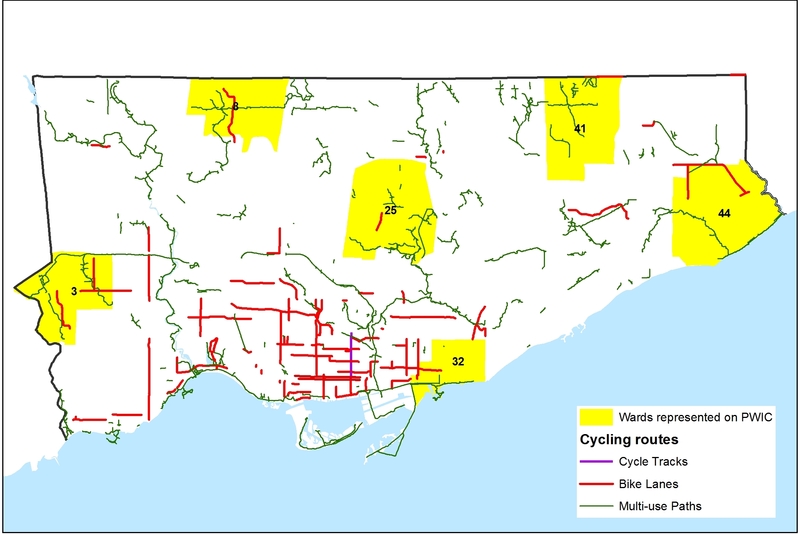 Cycling infrastructure and Public Works and Infrastructure Committee membership by ward. But the city will continue to grow, and we’ll see some progress on important issues, such as inclusionary zoning to build some new affordable housing. There are lots of good people — prominent advocates and people working behind the scenes, staffers and councillors at City Hall, community leaders and great organizations pushing for better — that desire a better city and continue to make Toronto great. There’s plenty of bold leadership for a city that needs it, but you’re not going to find it inside the mayor’s office. This entry was posted in Politics, Toronto and tagged City Hall, John Tory, Toronto. Bookmark the permalink.